Conor Sammon scored a double to help send Kilmarnock into the third round of the Co-operative Insurance Cup despite a plucky performance from Morton. The Scottish Premier League side went ahead after 24 minutes when Sammon scored from the penalty spot after being tripped by Ryan McWilliams. First Division Morton matched that when Ryan McGuffie scored from the spot after Tim Clancy fouled Brian Graham. But second-half headers from Sammon and Kyle ensured their was no cup shock. And for Kyle it was a perfect way to celebrate his recall earlier in the day to the Scotland squad. The first real chance fell to Morton when Jim McAlister ran on to a short corner from Kevin Finlayson and bore down on goal. But the end product was poor and was comfortably blocked at the near post by Alan Combe, who was back in the Killie goal for the first time this season at the expense of Cammy Bell after a hip problem had kept him out of the opening two league games. At the other end, Ryan McWilliams' palms were left stinging when Kyle collected a long ball from Craig Bryson before turning in the box and unleashing a powerful strike. The big striker was threatening again when he threw himself in front of a cross from the right from Mehdi Taouil only to nod just wide of target. Killie had looked most likely to open the scoring and did so when Sammon stepped up to rifle home a right-footed shot that left McWilliams no chance in the Morton goal after the striker was fouled in the penalty box. Morton hauled themselves level with a minute of the first half remaining with a penalty of their own. After Graham was fouled by Clancy, McGuffie did the honours from the spot, sending a confident, low strike past Combe. Morton emerged for the second half full of confidence and had a couple of decent half-chances after the restart as the home crowd grew increasingly restless. But Killie were back in front with 64 minutes gone when the ball broke kindly for Kyle and he whipped across the face of goal, where Sammon was waiting to direct a header past McWilliams from close range. A well-struck effort from Taouil rippled the side-netting before Killie substitute Manuel Pascali - who had replaced the injured Jamie Hamill at the break - just failed to connect with a Bryson cross just a few yards out. Sammon blasted over from the edge of the six-yard box when it looked easier to leave the net bulging and claim his hat-trick. Instead, it was Kyle who had the final say when he met a David Fernandez cross and nodded home from close range to seal the win. 90:00+2:42 The referee ends the match. 90:00+1:44 Erik Paartalu takes a shot. Alan Combe makes a save. 90:00+0:23 Erik Paartalu concedes a free kick for a foul on Gavin Skelton. Gavin Skelton restarts play with the free kick. 89:02 Assist by David Fernandez. 89:02 GOAL - Kevin Kyle:Kilmarnock 3 - 1 Morton Kevin Kyle finds the back of the net with a headed goal from close in. Kilmarnock 3-1 Morton. 88:30 Gavin Skelton is caught offside. Ryan McWilliams takes the indirect free kick. 87:05 Shot from just outside the box by Craig Bryson goes over the bar. 86:39 Inswinging corner taken by David Fernandez from the right by-line, Allan McManus manages to make a clearance. 86:25 The ball is sent over by Tim Clancy, clearance by Allan McManus. 85:18 Peter Weatherson gives away a free kick for an unfair challenge on Tim Clancy. Free kick taken by Alan Combe. 84:46 Effort on goal by Kevin Kyle from just outside the penalty area goes harmlessly over the target. 81:26 Substitution Erik Paartalu on for Kevin Finlayson. 79:12 Tim Clancy gives away a free kick for an unfair challenge on Ryan Harding. Free kick taken by Ryan Harding. 76:27 Conor Sammon takes a shot from close range clearing the crossbar. 74:44 Substitution Brian Wake comes on in place of Neil MacFarlane. 74:44 Kevin Finlayson fouled by Conor Sammon, the ref awards a free kick. Ryan Harding restarts play with the free kick. 73:01 Frazer Wright concedes a free kick for a foul on Peter Weatherson. The free kick is delivered right-footed by Ryan Harding from right channel. 72:46 Conor Sammon takes a shot. Save by Ryan McWilliams. 72:01 Gavin Skelton takes the free kick. 72:01 Booking Allan Jenkins is shown a yellow card for unsporting behaviour. 71:52 Unfair challenge on Craig Bryson by Allan Jenkins results in a free kick. 71:24 Craig Bryson crosses the ball. 69:54 Foul by Allan Jenkins on Gavin Skelton, free kick awarded. Alan Combe takes the free kick. 68:31 Manuel Pascali challenges Neil MacFarlane unfairly and gives away a free kick. The free kick is swung in right-footed by Ryan Harding, clearance made by Manuel Pascali. 67:54 The ball is sent over by Tim Clancy. 67:03 Effort from inside the area by Mehdi Taouil misses to the right of the goal. 64:03 Substitution David Fernandez on for Daniele Invincibile. 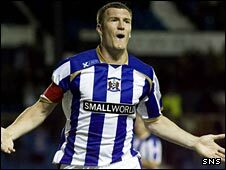 63:19 The assist for the goal came from Kevin Kyle. 63:19 GOAL - Conor Sammon:Kilmarnock 2 - 1 Morton Conor Sammon finds the net with a headed goal from close in. Kilmarnock 2-1 Morton. 61:48 Shot by Neil MacFarlane from outside the box goes over the target. 59:27 Booking Kevin Kyle is given a yellow card. 59:11 Free kick awarded for an unfair challenge on Allan McManus by Kevin Kyle. Ryan Harding takes the direct free kick. 58:57 Craig Bryson fouled by Brian Graham, the ref awards a free kick. Direct free kick taken by Tim Clancy. 56:14 Booking Gavin Skelton is shown a yellow card for unsporting behaviour. 55:59 Gavin Skelton gives away a free kick for an unfair challenge on Kevin Finlayson. Stewart Greacen takes the free kick. 54:28 Daniele Invincibile fouled by James McAlister, the ref awards a free kick. Free kick taken by Tim Clancy. 53:24 The ball is sent over by Mehdi Taouil, Daniele Invincibile takes a shot. Save by Ryan McWilliams. 53:24 Booking Kevin Finlayson is cautioned. 53:15 Kevin Finlayson gives away a free kick for an unfair challenge on Craig Bryson. 52:06 Short corner worked by Kevin Finlayson. 51:36 The referee penalises Mehdi Taouil for handball. Ryan Harding restarts play with the free kick. 50:43 Conor Sammon challenges Stewart Greacen unfairly and gives away a free kick. Ryan McWilliams takes the direct free kick. 49:51 Peter Weatherson has an effort at goal from outside the penalty box which goes wide left of the goal. 49:28 Handball decision goes against Conor Sammon. Ryan McWilliams takes the free kick. 48:45 Kevin Kyle is caught offside. Ryan McWilliams takes the free kick. 47:57 Free kick awarded for an unfair challenge on Manuel Pascali by Ryan McGuffie. Gavin Skelton restarts play with the free kick. 45:34 The referee blows for offside. Ryan Harding takes the free kick. 45:01 Substitution Manuel Pascali is brought on as a substitute for Jamie Hamill. 45:00+1:48 Gavin Skelton produces a cross, Close range headed effort by Kevin Kyle goes wide of the left-hand post. 45:00+0:46 Mehdi Taouil takes a inswinging corner from the right by-line to the near post, Ryan McWilliams manages to make a clearance. 45:00+0:18 Inswinging corner taken by Mehdi Taouil from the left by-line played to the near post. 43:36 GOAL - Ryan McGuffie:Kilmarnock 1 - 1 Morton Placed penalty scored by Ryan McGuffie. Kilmarnock 1-1 Morton. 42:36 Brian Graham fouled by Tim Clancy, the ref awards a Penalty. 41:03 Kevin Finlayson gives away a free kick for an unfair challenge on Kevin Kyle. The free kick is delivered right-footed by Jamie Hamill from left wing, Ryan McWilliams makes a save. 40:33 Peter Weatherson takes a shot from just outside the penalty area clears the crossbar. 39:58 Kevin Kyle is flagged offside by the assistant referee. Free kick taken by Allan McManus. 38:42 Allan Jenkins concedes a free kick for a foul on Jamie Hamill. Direct free kick taken by Simon Ford. 36:59 Tim Clancy sends in a cross, Daniele Invincibile produces a header from close range which goes wide of the left-hand upright. 32:22 Kevin Finlayson crosses the ball. 31:38 Kevin Kyle challenges Stewart Greacen unfairly and gives away a free kick. Free kick taken by Ryan McWilliams. 31:20 Foul by Neil MacFarlane on Craig Bryson, free kick awarded. Mehdi Taouil takes the direct free kick. 29:50 Kevin Kyle gives away a free kick for an unfair challenge on Stewart Greacen. Allan McManus takes the free kick. 29:20 Effort from the edge of the box by Peter Weatherson goes wide of the right-hand upright. 28:31 Kevin Kyle crosses the ball, Close range headed effort by Conor Sammon goes wide of the left-hand post. 27:03 Corner taken right-footed by James McAlister, clearance by Kevin Kyle. 25:45 Foul by Kevin Kyle on Ryan McGuffie, free kick awarded. Ryan Harding shoots direct from the free kick. 24:56 Close range effort by Frazer Wright goes wide of the right-hand upright. 24:25 Jamie Hamill fouled by Ryan Harding, the ref awards a free kick. Direct free kick taken by Mehdi Taouil. 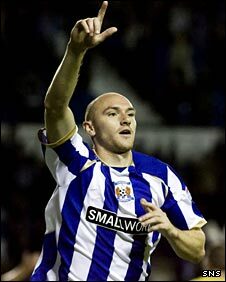 23:47 GOAL - Conor Sammon:Kilmarnock 1 - 0 Morton Placed penalty scored by Conor Sammon. Kilmarnock 1-0 Morton. 23:06 Unfair challenge on Conor Sammon by Ryan McWilliams results in a Penalty. 22:28 A cross is delivered by Mehdi Taouil, Kevin Kyle has a header from close range and clears the crossbar. 20:46 Free kick awarded for an unfair challenge on Brian Graham by Simon Ford. Ryan Harding takes the free kick. 19:29 Jamie Hamill concedes a free kick for a foul on Neil MacFarlane. Ryan Harding takes the direct free kick. 18:02 Free kick awarded for a foul by Gavin Skelton on Ryan McGuffie. Free kick crossed by Kevin Finlayson, Simon Ford makes a clearance. 16:07 Corner taken right-footed by Kevin Finlayson from the right by-line, clearance by Frazer Wright. 14:55 Conor Sammon produces a right-footed shot from deep inside the area which goes wide of the left-hand post. 11:17 Free kick awarded for an unfair challenge on Brian Graham by Craig Bryson. Free kick taken by Ryan Harding. 11:04 Inswinging corner taken left-footed by Gavin Skelton from the right by-line. 10:53 Kevin Kyle takes a shot. Ryan McWilliams makes a save. 8:02 The ball is swung over by Mehdi Taouil, Kevin Kyle takes a shot. Save made by Ryan McWilliams. 7:11 Free kick awarded for a foul by Frazer Wright on Ryan McWilliams. Ryan McWilliams takes the direct free kick. 6:44 Corner taken right-footed by Mehdi Taouil, save by Ryan McWilliams. 6:06 James McAlister takes a shot. Alan Combe makes a save. Correction - 5:42 Kevin Finlayson decides to take a short corner. 5:42 Short corner worked by Craig Bryson. 4:04 Neil MacFarlane is adjudged to have handled the ball. Simon Ford takes the direct free kick. 3:03 Kevin Kyle takes a shot. Save by Ryan McWilliams. 2:02 Free kick awarded for a foul by James McAlister on Daniele Invincibile. Alan Combe takes the direct free kick. 0:24 Allan Jenkins gives away a free kick for an unfair challenge on Craig Bryson. Direct free kick taken by Mehdi Taouil.